Peashooters in level 3-9 trying to fell some zombies. 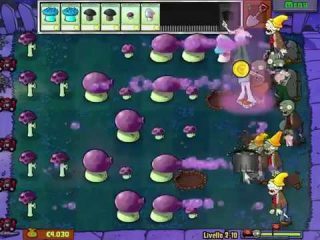 Plants vs zombies was one of those game which became a success as soon as it was released. And its success was (and still is) well earned. Many have praised this game for its simplicily, yet variety and its complex elements of strategy. The game belongs to the Tower Defense genre, where you must set up up defenses against hordes of enemies, usually to protect a certain place. In here, the place to protect is your house, and the enemies are zombies. And how can you fight back the zombies? Simple. By planting aggressive plants which will shoot them down with the power of nature. Seriously. That’s how it is. In any case, the gameplay system is not as difficult as you might think it is. After all, the developers of this game (Popcap) are well known for making simple games (Peggle or Zuma for example) but that becomes very complex should one look into the many possibilities that the game has to offer. In Plants Vs Zombies, you are presented a board divided in squares, were you can place your plants. Each plant costs a certain amount of “Sun Energy” which you can increase by clicking the little suns that fall from the sky (at least during the day, during the night you must find other means to produce sun energy). 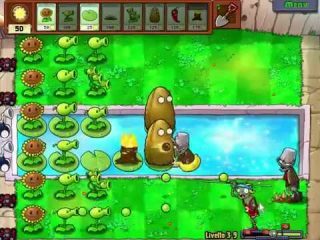 Zombies slowly come from the right to the left, and if you place plants in the right positions (usually in front of the zombies) they will attack them as soon as they can hit them. Mushrooms can really help on night levels. Normally, every zombie has his own weakness, for example a door zombie is weak against what I call the “Smokeshroom” which can shoot past his shield. 1) A way to produce sun quickly (there are plants, like Sunflowers, who do just that). 2) A basic and cheap method of offense (Peashooters for example). 4) Some of those plants, which I refer as “Instants” in the LP, who act like “bombs” to take care of any problems (like Cherries or Jalapenos). With this much to take into account, the game isn’t much simple as it looked anymore. The game’s main story has a total of 50 levels, divided into 5 worlds (Front garden Day, Front garden Night, Back garden Day, Back garden Night and Rooftop) with 10 levels each, with the 5th and 10th level of each world being some kind of “minigames” where different rules apply. The main story can be beaten in not a long time, but the game has so much more to offer. 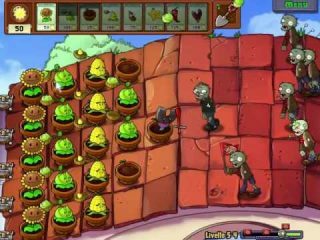 When you get on the roof, you must use different plants to hit the zombies. Minigames: kind of like “special missions” where, I said that before, different rules apply. Puzzle: Puzzles of some sort, basically. Survival: In here you play long versions of each of the 5 type of levels. You thought it would end here? Nope, apart from a series of achievments you can earn, there’s more. For example, Dave’s shop. You see, when you play, at times you will see coins popping up from defeated zombies. Buy collecting lots of those, you can buy stuff at Dave’s shop, such as powerups for your plants, upgrades for the game and many more. Additionally, Dave also sells stuff for the Zen Garden, a place where you can put plants (that you either buy from Dave or earn by playing) and by taking care of these plants you will an extra income that you can use in Dave’s shop. Anyway that’s the game. The many variety of plants, levels and ememies make this game look simple, but in reality it’s a game with a very deep system in which you need to strategize a lot. I really recommend you to play this game if you haven’t already. Note on the Let’s Play: Due to me having the Italian version of the game (and not being possible to translate it with a patch or something) I had to translate all the text as I read it (quite of a challenge for me if I say so) and because of that I made up a lot of the plants and zombies name (for example the Scaredy-Shroom became the “Shooter” and the Pole Vaulting Zombie became the “Running Zombie”).